In 2013 Kenneth heard about a mobile-based tobacco cessation service designed to help people stop smoking using SMS messages. 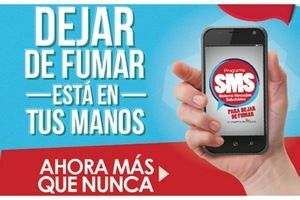 After a few days of reflection, Kenneth made a decision to register and within hours, he began receiving text messages from the mTobaccoCessation program, also known locally as “Sistema de Mensajes Saludables” (healthy message system). “I can’t say it was easy during the first few months. But with the determination and support provided by the programme the journey towards a tobacco-free life has been worth it. The mobile service is just great and I would encourage others who want to quit smoking to enroll,” says Kenneth. The mTobaccoCessation program in Costa Rica was launched in 2013. It was the first programme under the Be He@lthy, Be Mobile initiative, a global program jointly run by the ITU and the World Health Organization (WHO). Be He@lthy, Be Mobile works with a network of governments and global experts to help scale-up successful health interventions which use mobile phones to deliver services. So far the focus has been on tackling the prevention and management of chronic non communicable diseases (NCDs) including cancers, diabetes, heart disease and lung disease. Together these diseases account for around 38 million deaths a year, or over 65% of annual global mortality – but health systems are not always sufficiently equipped to help people prevent and manage the conditions, especially at the scale needed. In the mTobaccoCesation programme users register by sending a text message saying ‘I want to quit’ to the designated short code 4321. This immediately triggers their enrolment in the service, which then regularly sends them SMS messages that offer encouragement, advice and quit tips on avoiding tobacco during the first few critical months of a quit attempt. The service is also interactive, allowing users to send SMS requesting extra support at personal times of vulnerability, such as when they are experiencing a particular moment of craving. Since the initial programme in Costa Rica, the initiative has gone on to support many mHealth programmes around the world – some at considerable scale. In India, between January and December 2016 over two million people have registered in a national mTobaccoCessation service run by Be He@lthy, Be Mobile initiative to help people quit smoking and chewing tobacco. Other countries have been able to access the programme content and experiences to use in designing their own programs. Tunisia and the Philippines are currently preparing to launch their own mTobaccoCessation programmes in 2017. This level of scale and collaboration is an important step in helping countries meet the ambitious targets of the 2030 Sustainable Development Agenda, with its commitment to achieve universal health coverage (SDG 3). The approach is not limited to tobacco. In July 2016 a mobile-based diabetes service was launched in India using the same baseline technology and partnership structure as the mTobaccoCessation program. It currently provides information to over 97,000 people on simple measures for preventing and managing diabetes in between clinic visits. Other countries have been showing how the flexibility of mHealth systems can respond to local needs. Every year during Ramadan fasting, the health authorities in Senegal note a significant increase in the hospitalization of people with health problems related to poor diabetes management. To address this problem Senegal has established an annual mobile diabetes campaign, known as mRamadan, which provides evidence-based advice on safe diabetes management to people with diabetes via SMS. The service runs throughout Ramadan and in 2016 saw over 50,000 users enrolled on the program. “Ask your doctor to adapt the dose and timing of your medication before you fast”. A similar mDiabetes programme has been launched in Egypt and saw its own mRamadan campaign reach 50,000 people in 2016, with plans to expand the service in 2017. A partnership between the Ministry of Health and Be He@lthy, Be Mobile has also seen the successful launch of an mCervicalCancer service in Zambia in October 2016. The service aims to reduce the country’s high prevalence of cervical cancer, which can be prevented and treated if detected early. Women between the ages of 25 and 59 years are encouraged to register with the programme, after which they receive mobile phone text messages encouraging them to go for cervical cancer screening by explaining the risks of the disease and how simple the screening is. The initiative is also working with high-income countries to look at how existing digital tools for NCDs can be shared with other countries and adapted for use in othertouching-lives-4 contexts. In the United Kingdom the initiative is working with the government to look at digital solutions for heart disease and its risk factors, whilst in Norway the country is trialing digital support for chronic obstructive pulmonary disease (COPD). Content from both of these programmes will be shared with the initiative and built into global handbooks on mHealth programmes for heart and lung health, which will be available for other countries to adapt and adopt. ICTs have the potential to deliver real benefits across the global healthcare ecosystem. To further this effort, the ITU’s Telecommunication Development Sector has initiated dialogue and cross sectoral collaboration with various players in the health sector to promote the use to ICTs to improve the quality, equity and accessibility of health services. In May 2016, ITU and WHO achieved a historic milestone by bringing together ministers of telecommunication/ICT and ministers of health for the first time at an inter-ministerial round table, to discuss the use of ICTs to improve universal health coverage, potential strategic opportunities for the adoption of digital technology in the health sector and the importance of continuous cross-sectoral collaboration. The round table was preceded by a high-level policy dialogue on digital health under the theme “Digital Health for Healthy Lives and Well-being for All”. The dialogue was attended by ministers of telecommunication/ICT, WHO representatives and a variety of stakeholders from industry, academia and civil society. Participants examined the key role ICTs can play to support the attainment of SDG 3: “Ensure healthy lives and promote well-being for all at all ages.” New trends that may positively impact universal health coverage – such as the Internet of Things and the practical applications of big data – were also discussed.